So how do you balance creating cute, memorable, holiday experiences with your kids without the headache of spending three hours planning it and the heartache that inevitably ensues when your kids only stay engaged for three minutes before moving onto the next thing. The answer is easier than you think. Just do something! Two days into some nasty virus and being stuck at home, my stir craziness reached its peak and I had to do something besides lay on the couch. 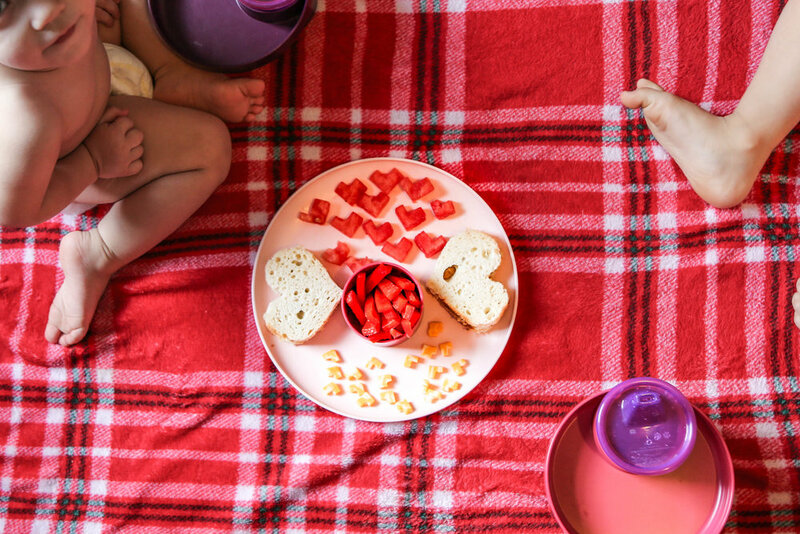 And since it’s the week of Valentine’s day I declared to the kids that we’d be having a Heart Picnic for lunch. Within 10 minutes I had peanut butter sandwiches sliced with a heart-shaped cookie cutter, a cheese stick cut into hearts and watermelon planks with the same corner cut out to give it that signature Valentine’s flair. I sliced some red peppers too, but those didn’t get to be heart shaped because this mama’s creativity only goes so far. Both of my kiddos grabbed what they wanted and we used out favorite Travel Trays to keep the mess at a minimum. Was it perfect and fancy and worth blasting all over Pinterest? Honestly, probably not. But that’s not what matters. What matters is my kids had fun. Oh, and I had fun too (because I didn’t stress over every tiny detail, like I normally do). So make Valentine’s Day fun! Share what you’re doing this year below! And if you do a picnic like ours I can’t wait to hear about it!